In just under a month, The Cook Grocer will be hosting our second Long Lunch in under a year. Our urban event is the creation of Daniel Raad, our local grocer, who wanted to showcase some of his favourite wineries in our region and pair their wine, with a curated menu. The aim? To have the people of Canberra and beyond experience something utterly unique! about what the Long Lunch will entail for everyone attending. Stephanie Helm grew up roaming the vineyards of Murrumbateman. Her destiny was chosen- to work with the land, its soil and beautiful grapes, to make sumptuous wine at The Vintner’s Daughter. You can only imagine how drawn we were to having The Vintner’s Daughter be our showcase winery for our Wintery Long Lunch. When someone’s DNA is in their product, you take notice. The Vintner’s Daughter winery produces premium wines from our Canberran, cool climate wine district. 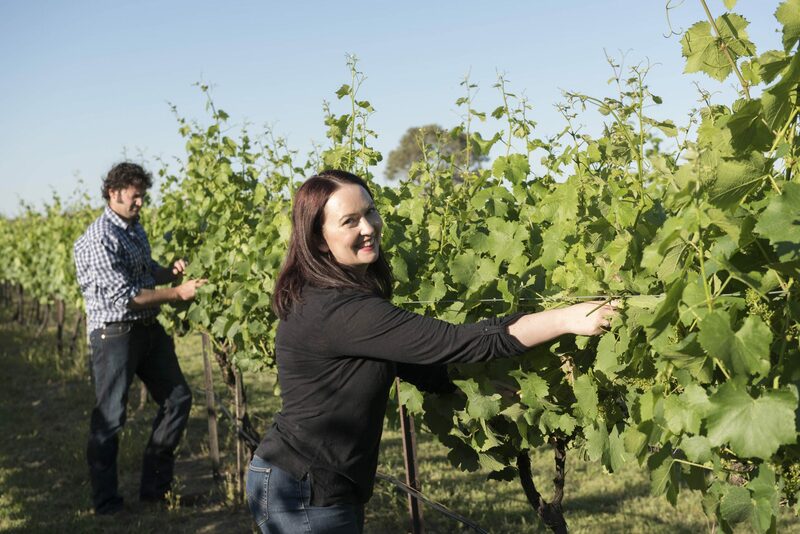 In 2014 the wife and husband team, Stephanie Helm & Benjamin Osborne, located themselves to Murrumbateman, a little place us Canberran’s call ‘winery gold’. Murrumbatemen is on the outskirts of Canberra and boasts some of our regions finest, award winning wineries. It’s our cool climate wine producing mecca. Think rolling hills, gold grassy paddocks, lots of sheep, lots of cows, plentiful acres of vineyards, country homesteads and a community that embodies its’ fine food they produce. It truly is a Foodies Heaven. What would entice someone to attend The Long Lunch, which is showcasing Vintner’s Daughter Wines? Stephanie – This lunch is going to be all about spoiling yourself and a great way to lift your spirits in the last month of winter. It’s focused on winter flavours – which in Canberra means the ultimate luxury food – truffles! These flavours will be complimented by a range of different wines so that over the course of the lunch you will move from my crisp and refreshing Riesling to my spicy, peppery and robust Shiraz. Stephanie – For me, winter food is about cosy and comforting food – hearty roasts and slow cooked meats enjoyed with a glass of peppery Canberra Shiraz. And could you describe what Winter is like for the winery and what type of work you do at this time of year? Stephanie – Things are a little quieter in the vineyard and winery at the moment, pruning has been completed and the vines are deep in their winter sleep. We have just finished bottling our 2018 whites and 2017 reds but the 2018 reds will mature quietly in French oak barrels until next winter. It’s about the only time of year we can relax a bit and enjoy a long lunch! On Saturday the 18th August we will feature The Vintner’s Daughter as our showcase winery for The Long Lunch. With hand selected local culinary fare by WoodBrook – A Food Project, and hand picked Truffles from The Blue Frog Truffle Farm, Stephanie Helm from The Vintner’s Daughter will take you on a journey of the senses, a foodie and wine lovers delight. Each course in our six course degustation will be paired with a handpicked wine from The Vintner’s Daughter. Renowned for creating unique wines that reflect the land and the passion of the makers, Stephanie will allow your taste buds to explore the wines and wintery fare.